There are many different breeds of dogs and their diet varies. There are foods which may be good for them just like there are those which may cause them harm. A healthy diet is also imperative for dogs. Dog owners should have a deeper knowledge of what to feed them. They should also know foods that are bad for dogs in order for them to avoid giving it. It will have to be a conscious effort on their part because their pets would not know which of the things they eat are good for them or not. Their health depends on it. Though dog foods are readily available in the market, there are many instances when the dog owners would give them something else especially if they come wagging their tails and looking so woeful. Unwittingly, foods that are bad for the dogs are given. These might include processed foods which are laden with chemicals which may cause allergic reactions. Chicken bones or even fish bones are also no-no’ s for dogs. The bones might splinter and cause them to gag or be choked. It might also lacerate the digestive tract of the dogs. ﻿﻿﻿﻿﻿Choco﻿﻿﻿﻿﻿late may be favored by the dog owner but it might be harmful to dogs because of the caffeine contained which might affect the dog’s nervous and circulatory systems. The same goes for other foods or drinks which has caffeine. So then what about ice-cream? So is Icecream good or bad for my dog? How many dog owners out there have eaten ice-cream on a hot day and wondered, ‘Is it safe to give some to my dog?’. When an owner knows that their furry friend is suffering in the heat, they naturally will want to do anything they can to ease their dog’s discomfort. Will this cool treat harm our dogs more than help them, or it is a safe way for them to beat the heat? More owners are starting to feed their dogs some of the natural foods they eat, because whole foods like meat, fruits, and vegetables provide dogs with the essential nutrition that they need to thrive. The problem is when people start to feed their dogs salty, sugary, processed foods that can do a lot more harm than good. The answer is that ice cream is unhealthy for dogs because it is a sugary dairy product, but it won’t make them very sick if it is fed to them in small amounts. The best thing for owners to do if they want to feed their dogs ice cream is to make healthy ice cream without all the added sugar that is in the store-bought stuff. Pet owners can also find specially made and portioned dog ice-cream as another alternative to human ice-cream, but it can be pricey. Giving a dog a small amount of ice-cream (if it isn’t chocolate, of course) won’t kill them. The most that might happen with some dogs if the dairy doesn’t agree with them they will have trouble digesting it. 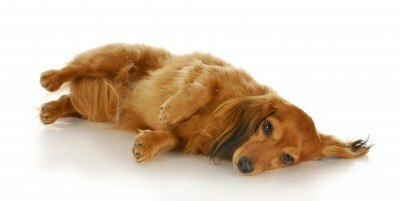 Owners should also keep an eye out for bloating, which could be a more serious side effect. The reason that ice-cream makes some dogs sick is because many dogs are lactose intolerant. Like humans, dogs can have trouble reliably producing lactase, an enzyme that helps break down lactose. If an owner’s dog tends to develop gas and/or loose stools after eating dairy products like ice-cream, it is likely that they are lactose intolerant. If that is the case, owners should stop feeding their dog things like ice-cream, cheese, and yogurt. This table shows the lactose content of common dairy foods, with cheese showing the least lactose content and ice cream containing 6 grams. The bigger, more sinister issue here is sugar. Ice-cream is very sweet and sugar is not good for dogs. 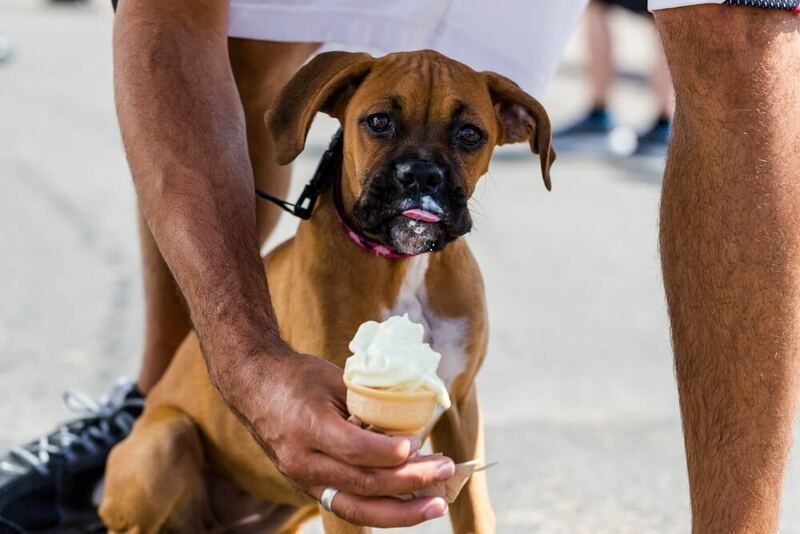 Owners may only feed their dogs small amounts here and there, but over time repeated ice-cream ‘treats’ could lead to weight problems, diabetes, and dental issues. An unhealthy dog means more vet bills and no one wants to see their beloved family pet sick, so watching what they eat is important. 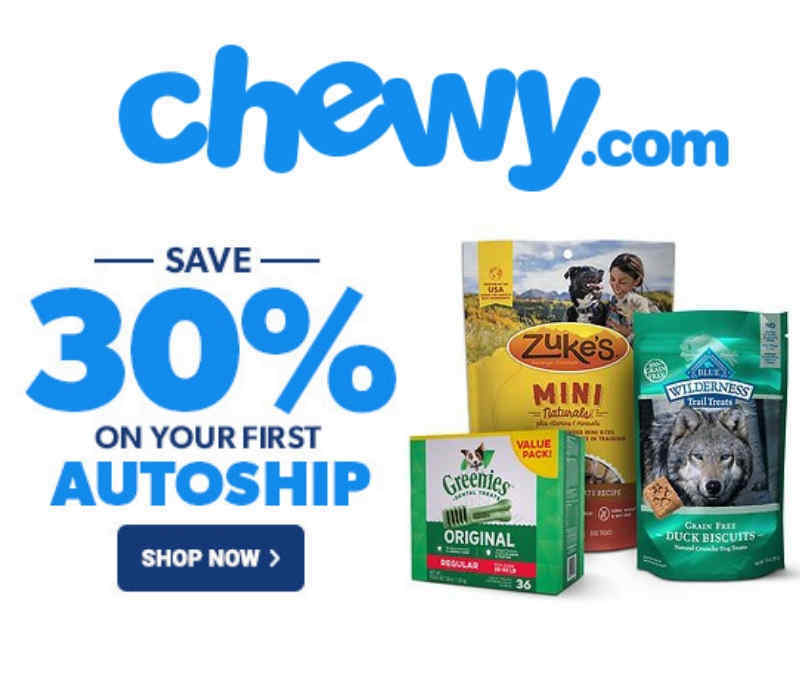 Also read: Best Dog Food for Skin Allergies? Bloating is one of the symptoms of being lactose intolerant. Even though a little bit of grocery store bought ice-cream probably won’t hurt a dog, it’s best avoided if owners want their dogs to stay healthy. The good news is that there are a few cool alternatives that dogs can enjoy on warm days that don’t have as many harmful ingredients. Owners’ best option is making healthy homemade recipes without adding sugar, so they know exactly what they are feeding their dogs. Puka loves her Doggie ice cream sundae. Simply combine one small tub of freshly mashed strawberries and 3 to 4 cups of low fat plain yogurt. Freeze the ice-cream overnight and it will be ready to serve to your dog (and even your family) as a cool treat! Mash one ripe banana and combine it with 2 cups of low fat plain yogurt. Mix this with one cup of melted peanut butter and two tbsps. of honey until all the ingredients are well mixed. Owners can then freeze their ice-cream creation overnight so their dogs can enjoy it the next day! In a blender, combine one can of 100% pure pumpkin puree, ½ cup of peanut butter, and 1 cup of plain yogurt blending until smooth. Pour the mixture into a ice cube trays or freezer safe containers to freeze overnight. Since peanut butter, bananas, and pumpkin are all healthy for dogs in moderation, this is a great healthy, limited ingredient dog treat recipe. Marketed through Amazon and the Puppy Cake website this product comes in powder form. In order to create the frozen treat, mix in with 2/3 cup of “very hot” water and leave it in the freezer for 5 hours and more. After which, your furry child will be able to enjoy ice cream in flavors such as Peanut Butter, Maple Bacon, Carob (chocolate alternative to chocolate), or Vanilla for $6.99 a pint! 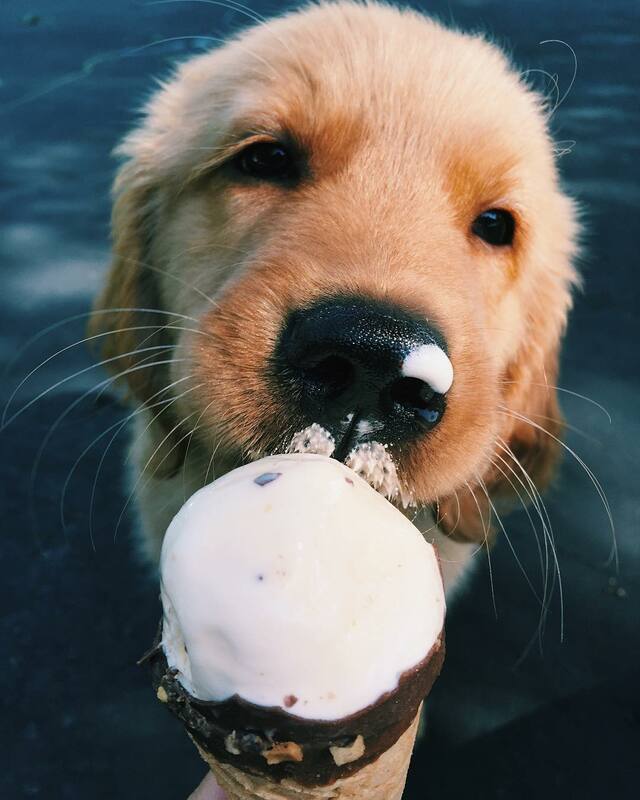 It’s totally understandable that owners would want to feed their dogs a little bit of ice-cream on a hot day. Unfortunately, ice-cream is one human food that isn’t good for dogs because of its sugar and dairy content. A lot of dogs are lactose intolerant, so owners should look out for signs that dairy products don’t agree with them. Luckily, dogs that aren’t as sensitive to lactose, there are a few ice-cream recipes out there that use healthy ingredients for dogs. Yogurt is used as a substitute in most of these recipes, because it is lower in dairy content than cream. These recipes are easy to make and both dogs and humans can enjoy them without guilt!